GDP growth during the last quarter of 2012 turned negative in the US (-0.1%) and this came as a surprise to many. Looking at the different components of GDP, the biggest decline happened in government spending and in net exports (due to the weakness in other economies). This is just one quarter and the data is likely to be revised later in the year, but what is to be learned from the data? The answer is whatever justifies your priors. Here is the interpretation that Larry Kudlow does in CNBC, which is a good example of how statistics can be interpreted in so many different ways. "Even with the fourth-quarter contraction, the latest GDP report shows that falling government spending can coexist with rising private economic activity. This is an important point in terms of the upcoming spending sequester. Lower federal spending, limited government, and a smaller spending-to-GDP ratio will be good for growth. The military spending plunge will not likely be repeated. But by keeping resources in private hands, rather than transferring them to the inefficient government sector, the spending sequester is actually pro-growth." So this is an interesting test that he is using to prove that decreasing government spending is good for growth. As long as we see any growth in private spending it means that the decrease in government spending is helping the private sector grow. Of course, the real test is to compare the -0.1% to what would have happened to GDP growth if government spending had not decreased. Reading Larry Kudlow's article it sounds as if GDP growth would have been even lower (although his statement is not as precise as this). Yes, consumption grew and investment (once we exclude inventories) grew as well, but how much? Not enough to compensate the decrease in government spending so the final outcome is a negative (literally negative) performance for GDP growth. So if we were to use just this observation to understand the fiscal policy multiplier, what would we learn? [Just to be clear, we should not be doing this, to understand fiscal multipliers we need more than one quarter of data, but I am just trying to follow his logic] I see that GDP growth is low and certainly much lower than what anyone would expect taking into account that the US economy is still below potential. We see that government spending fell and this is a component of GDP. A natural reaction might be to argue that the fall in government spending had a negative effect on GDP. Given that the GDP growth number is so low (and lower than expected), this is a reason to believe that the multiplier is positive and possibly large. But, as Larry Kudlow shows, there are always other interpretations. Noah Smith has a great blog post on the obsession with gold as a store of value or as an investment strategy. I fully share his views on gold and in particular about the arguments made by those who see gold at the center of the world economy and the best investment one can do these days. Interestingly, his blog post comes the same day that all business media report on the announcement of the Bundesbank that they are moving some of the gold reserves back to Germany. The move of these gold reserves is partly seen as a response to an earlier report by the German court of auditors that was concerned with the lack of checks on the gold reserves held abroad. "To hold gold as a central bank creates confidence. We build trust at home and have the possibility to exchange gold at short notice into foreign currency abroad." I am really curious about what (doomsday) scenarios he has in mind where the gold reserves of the Bundesbank would become crucial to restore confidence. By the way, the gold reserves of the Bundesbank which at 130 Billion Euros are large compared to other central banks seem small compared to many other magnitudes that matter in financial markets, more so during crisis time. And I am assuming that these scenarios are catastrophic, otherwise why would gold be needed to buy foreign currency. And given that they are thinking that those scenarios are likely, is there anything that they are planning to deal with them? There is, however, one positive outcome out of this news and Mr Thiele's quote. I need to teach my students tomorrow about central banks and the history of the monetary system (including the gold standard) so I know have some good material to motivate my lecture. Regularly The Wall Street Journal writes an opinion article about the failure of the European economic model. A bloated welfare state, high taxes, heavily-regulated labor markets have led to a disappointing economic performance. The predictions are generally dire and after reading the article it seems that the only remaining question is how long the European countries and the Euro project will survive. The latest of these articles was published yesterday under the title "Europe's Bankrupt Welfare State". "Some observers will blame the joblessness and lack of growth in the euro zone on the austerity supposedly being imposed on the Continent by Berlin. But the real story is more ominous. (...) Europe's vaunted social model has struggled to generate growth or jobs for decades. (...) The euro zone may be enjoying a respite. But the economic evidence shows how little has been fixed. Mr. Draghi's blank check addressed the symptom, but not the cause, of the euro zone's economic woes. And unless those are addressed—with more flexible labor markets, a smaller state and lower taxes—the crisis will be back in the form of social unrest, political populism and a generation of young Europeans who don't know what it is to be able to find a good job." I have no trouble with the statement that Europe needs structural reforms. But the notion that "economic evidence shows how little has been fixed", that "Europe's model has struggled to generate growth or jobs for decades" and how the European model is "bankrupt"seem to be overstated. Even worse, these articles seem to be written as a way to scare those in the US economic policy debate that argue in favor of anything that resembles the European model (higher taxes, more regulation, a universal healthcare system). But is the evidence as clear as the Wall Street Journal suggests? 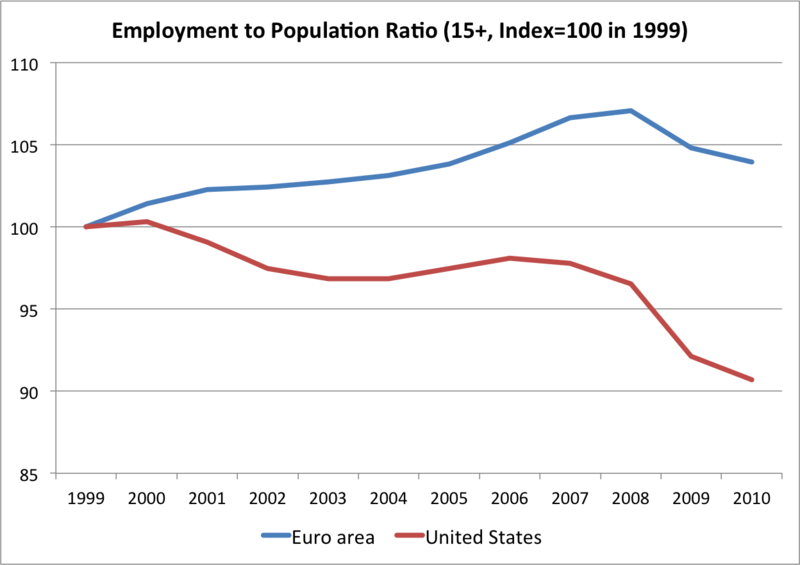 Has the Euro failed so badly in terms of generating employment and growth? 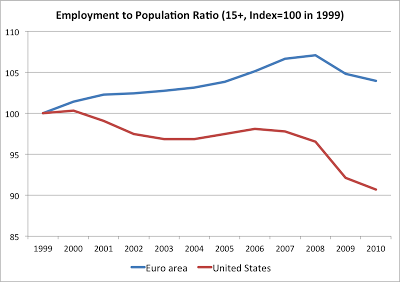 Below is the employment to population ratio (for those over 15 years of age) for the Euro area compared to the US during the years where the Euro has been in existence. The series are rebased so that their value is equal to 100 in 1999. Since the Euro was launched, its members have seen a small increase in this ratio, but the performance has certainly been better than that of the US labor market. Just to be clear, the level of the employment to population ratio in the Euro area still remains below that of the US today, mainly because of historically low female participation rates in Southern Europe. But given that claim in the WSJ article is about growth and creation of jobs since the Euro has been in place, using the year 1999 as a reference seems the right thing to do.